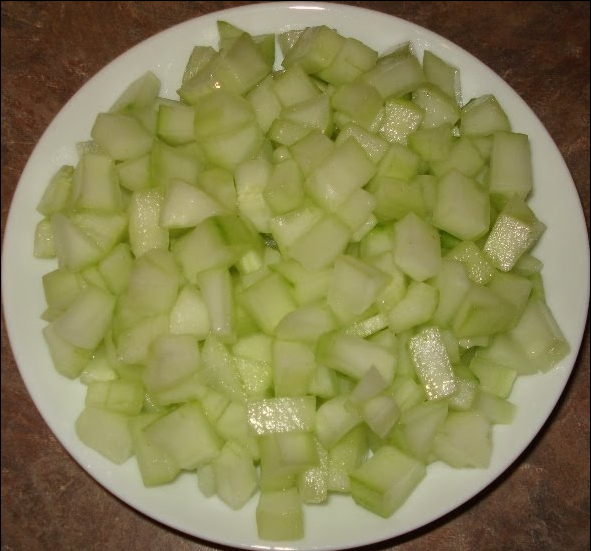 Peel the cucumber, remove the inner part, seeds and chop them into medium sized pieces as shown in the picture below. Grind 2.5 - 3 cups of fresh grated coconut into smooth paste by adding little amount of water. Squeeze the ground coconut, by placing it in a clean cotton cloth. After this process, add around 1.5 cups of water to the squeezed coconut, mix well and squeeze it again. Cook the chopped cucumber in a vessel by adding around 1 cup of thin coconut milk. Once its cooked, add jaggary, pinch of salt and bring them to boil. Keep this in low/medium flame for about 3-5 mins. Take around 1/4 cup of thin coconut milk in a bowl, add rice flour / batter and mix them well. Add this to the vessel containing cooked cucumber and bring them to boil. Add thick coconut milk and bring them to boil. A variety of cucumber seen in this part of the country,coastal Karnataka and Kasaragod is the best for this recipe.being seasonal it is a bit difficult to buy.And it should be at a particular state of growth,neither too tender nor too grown. bele (greengram dal) is a best combination with mullusouthe (cucumber) for payasa.The greengram should be heated without oil on a pan till it turns brownish. It's totally different.... Never heard of... Try maadbeku..Looks yum... Doctors ella bandu prescription kodtha iddaare.... Olle untu....I love Mangalore's mullu southe... I remember my childhood... they grew it at home & we as kids, even before it could grow, would pluck it off to eat as it tasted heavenly... My Ajji always kept an eye & shooed us away... Olle Maja ithtu maathra....Aa Dinagalu...!!!! This payasa is new to me but the step by step demo is very nice,and thanks for sharing. Read about recipe of it for the first time. I do try it as its Sunday.